Sometimes you encounter something so basic, so obvious, that it seems like it’s just part of the fundamental essence of being a human. Well, specifically, being a human that turns discarded home materials into little racecars. 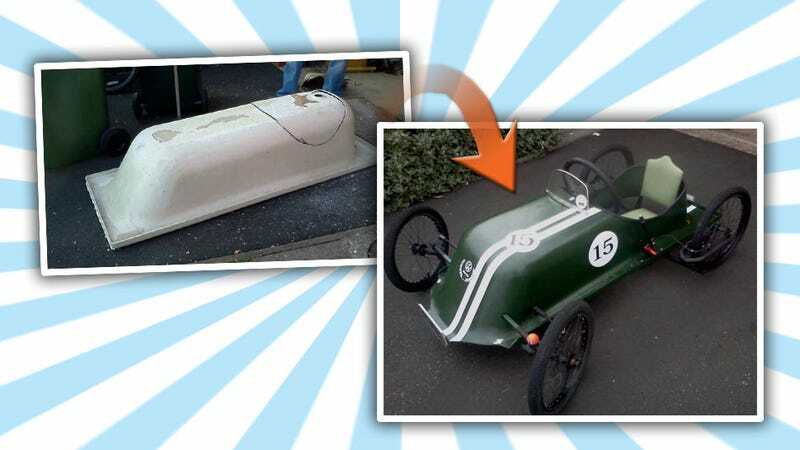 Like this extraordinarily well-done bathtub racer. I saw this on the Журнал Custom Culture Facebook page, which, translated, seems to mean ‘Magazine Custom Culture,’ so it’s some Russian car custom culture magazine I don’t really know anything about. I hope they don’t have long, rambling virulently racist essays or something. But this little bathtub racer is so simply and nicely done. Flip it over, one good cut, plop it on a nice little steel-rod-frame chassis, some paint, and boom, a charming little soapbox derby car or pedal car or go-kart. You could easily fit a little lawnmower engine somewhere in there, I’m sure. You could re-position that hole to make a mid-rear Auto-Union style racecar, paint it silver and have a dead ringer for the Monopoly car or whatever. I’m sure this has been done many times before, but there was just something so nice and charming about this particular execution I wanted to share it. I don’t quite know why it’s wearing VW badges, other than the maker probably likes VWs. Now I want to do something with the six or seven old tubs I have littering my yard, if I can drive the mutated monitor lizards out of them.